Tabbouleh | Morning Coffee . . .
To me, Tzatziki sauce is just about the best sauce mankind ever created!! I could “bathe in that sauce” (to quote Gilmore Girls) ;). If you are in the mood for a meditterean flare then you’ll love this meal. You can eat this in a pita as a sandwich or use the tabbouleh as a side salad (warm or cold). With some grilled salmon fillets or kabobs…. In a small bowl add greek yogurt, chopped cucumber, grated red onion, chopped fresh mint, chopped fresh dill, the juice from half lemon, 1 tbsp olive oil and salt. If the sauce is too thick, add 1/2 tbsp of water at a time until desired thinness is reached. Add couscous , scallions, parsley, mint, tomato, cucumber, olive oil and lemon juice (starting with half a lemon) & chickpeas to a small bowl and mix. let it rest for at least 30 minutes before serving so the flavors will have a chance to blend. Heat the pita until it’s soft. 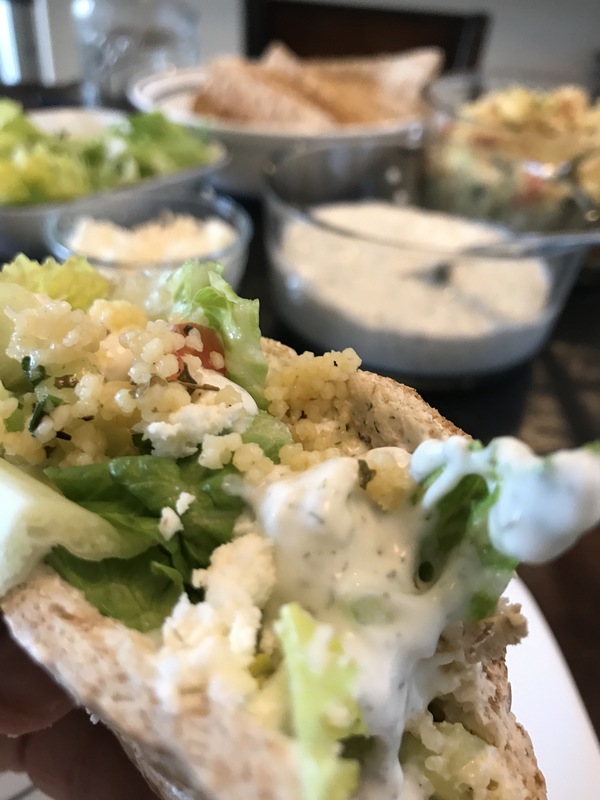 Add tzatziki to the center (I like to spread it all on the inside of the pita covering every surface – mmmm) and top with lettuce, cherry tomatoes, red onion, tabbouleh, feta cheese, mint, parsley, and dill, then more tzatziki sauce on top :). Serve immediately. If you have left over Tabbouleh, it is good the next day as a cold salad to go with your meal…topped with a little TZATZIKI Sauce, of course! !